When you imagine a romantic destination for two, Paris and Venice may be the first places that come to mind. 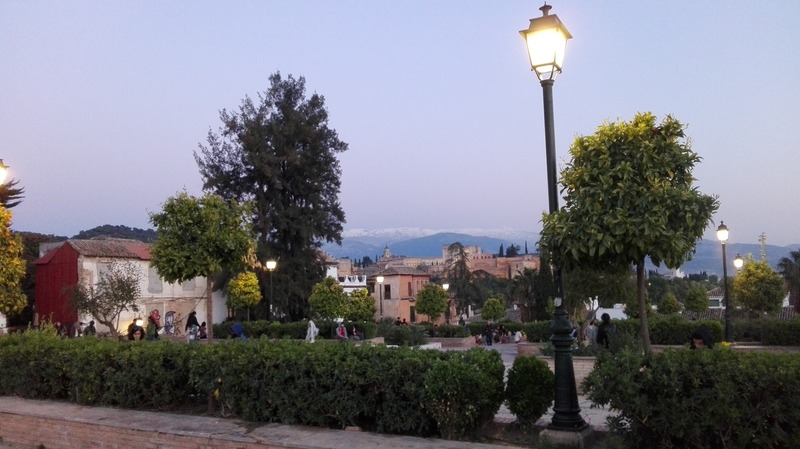 But Granada, with its charming Arabian Nights atmosphere, holds some wonderful surprises. 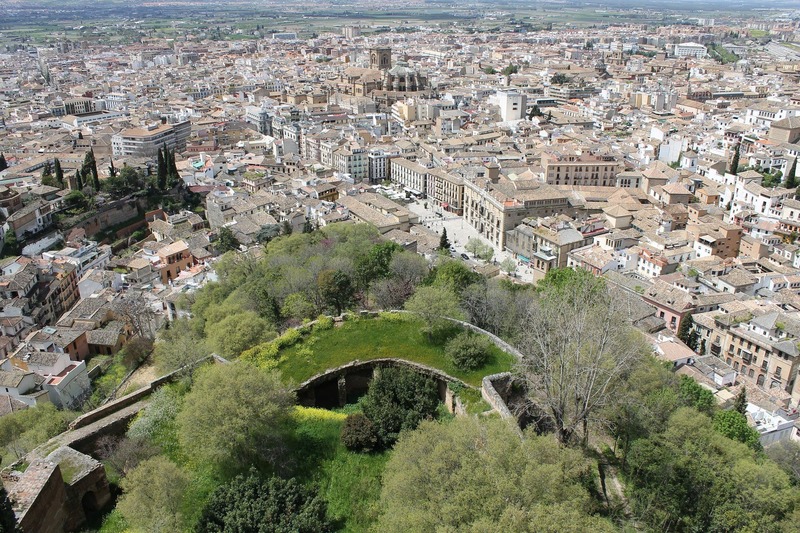 I was first in Granada on a school trip back in 2009; it was one of those ‘The-whole-of Andalusia-in-three-days’ trips. 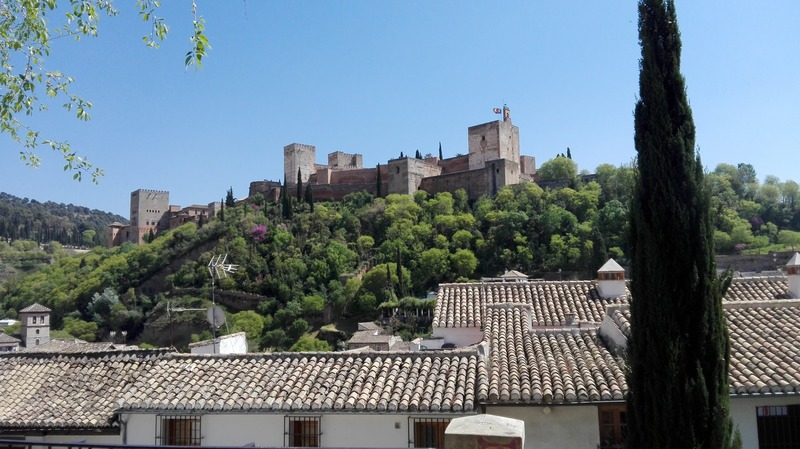 Every year since I have had a desire to spend my summer holidays in Granada, but every time I looked for plane tickets, the prices were a bit too steep. This year, my boyfriend and I wanted to visit a city with a lot to offer but not excessively big either. It was important to be able to spend a few relaxing days together after a very intense period at work for both of us. And we have too many friends living in Paris, so the getaway would have most likely wound up not being just for the two of us. Our trip began with a 6.15am flight from Malpensa, and continued with a walk in Plaza de Bib-Rambla and Alcaiceria; a real souk with jewelry, fabric and craft shops that used to be a silk market during Moorish rule. 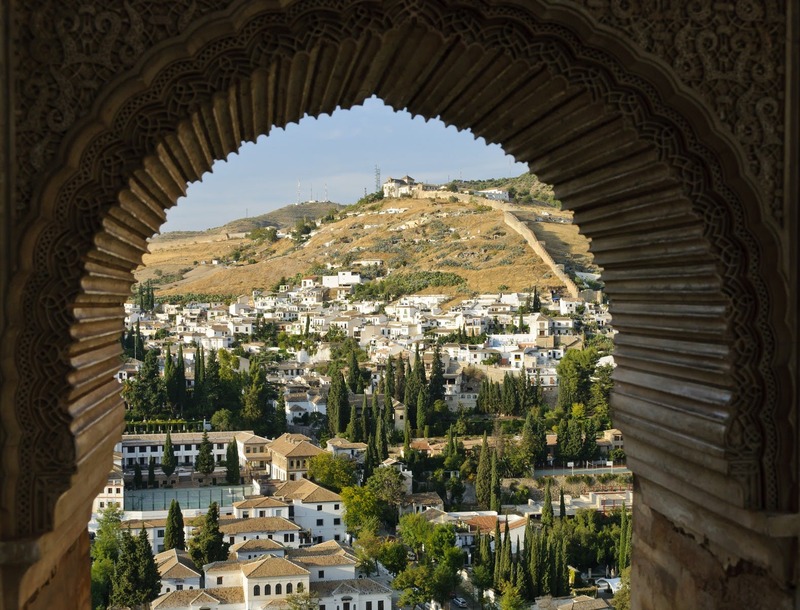 Traces of Moorish rule are found throughout Granada, with the Alhambra is its most majestic landmark. Fascinating, wonderful, but above all, huge, the Alhambra’s size is the most important factor you should consider when you decide to visit. I think the Alhambra might be the worst place to improvise as a traveler as there are too many details to identify and the impressive structure is just way too big for anyone to get away with not having some kind of help. In our case, it was the friendly and well-trained Asier. He led us among the flowers and fragrant orange groves of the Generalife; he showed us the remains of the thousand-year-old tree behind which the Sultan’s wife and her lover met in secret; he took us to the Throne Room, which is not at all like you would expect after watching Game of Thrones. The symbol of power was not an impressive seat, but a dimly lit area beneath a window where the Sultan had a full view of what was happening around him, in the opposite building and under the walls. It was designed in such a way that those who talked to him were blinded by the light that penetrated from behind him. Asier explained the significance of the magnificent decorations that line the building’s walls and showed us the harem room and the Palace of Charles V, which is incredibly similar to Florence’s Pitti Palace. The Alhambra tour lasts several hours and, in the best-case scenario, takes place under the sun. In other words, save your cute and stylish outfits for another day. It’s better to wear hiking shoes and a sun hat than risk a first-degree burn on the tip of your nose, which is much more unsightly and painful. This attire is also appropriate for Albaicín, Granada’s Moorish hilltop Moorish quarter. The first streets are filled with tourist-targeted bazaars (although you can find some beautiful leather bags) and teterias (tea rooms) offering hookah sessions for a steep price – which can be fascinating and transgressive for teens on a school trip, but far less attractive past the age of reason. 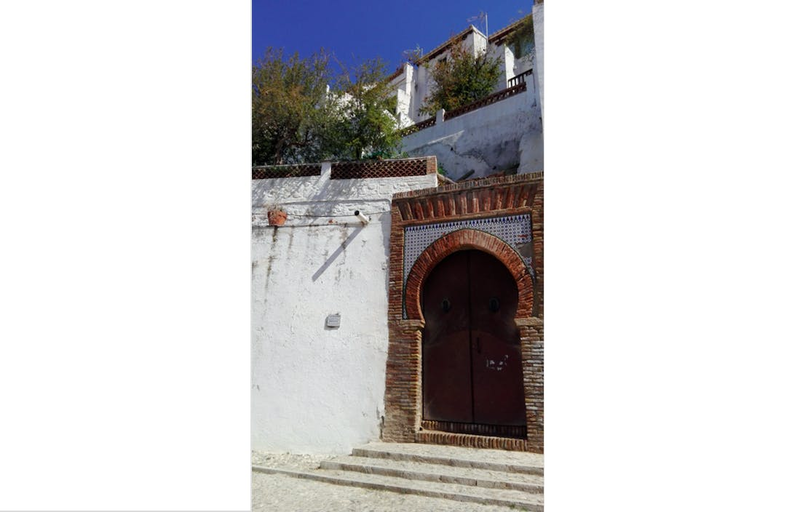 Climbing from Callejon del Gato, you can enter the quarter’s residential area characterized by white houses with wrought iron railings and flowered terraces. You won’t find hordes of tourists huddled in every corner and you can admire the city without having to take your ritual selfies while rubbing elbows with another couple. Wandering through the quarter’s winding streets we found Centro Artesanal Albaicín El Gallo, an indoor market consisting of different shops: a stringed instruments shop, a pottery workshop, a silversmith workshop and a handmade carpet shop. If you have a big enough budget and room in your suitcase, you will certainly find something to bring home, perhaps some exotic decor. The most romantic part of the weekend was undoubtedly the afternoon we spent at the Al Andalus Arab Baths. What do you mean, afternoon? You’d object. Isn’t it much more romantic to go there in the evening? Probably so, and for this reason, the evening time slots are besieged; admission requires a prior reservation for a limited number of guests, so the baths are protected from large crowds. But you should definitely book your tickets for the afternoon: You will have the luxury of occasionally being alone in one of the tubs or in the Turkish bath. A mist of fragrant steam pervades the Arab Baths, light is suffused and it only penetrates from some openings between the colorfully decorated tiles on the ceiling. Once inside, you’ll want to stay there forever, especially because you will be offered exorbitant quantities of extraordinary mint tea, so good that those heavenly 90 minutes were enough to develop a personal addiction. But that’s another story. For a few more euros you can enjoy a 15-minute massage with a scented oil of your choice, and I can assure you that it will be well worth the cost. After this beautiful experience you will feel smooth, fragrant, relaxed, and in love – the perfect mindset for a hand in hand stroll along the stream that runs across the hill that the Alhambra is perched upon. In addition to Granada’s Arab and Moorish wonders, there are two must-see Baroque gems: the Cathedral and the Basilica of San Juan de Dios, or what I like to refer to as the most Baroque of all Baroque churches in the world. Opulence, gold, stuccos, gold, relics, more gold, statues and still more gold. The Basilica’s apse is a blinding game of weavings and details; the interior is open to visitors and is as wide as a two-room apartment. On the culinary front, Spanish and Arab influences can be found in the city’s various restaurants. We had a great brunch that included “pan y tomate” and eggs Benedict at Cafè Baraka. Then, we enjoyed a tapas dinner at Taberna La Tana, where there were no tables but only a few seats at the bar. Later, we snacked on both traditional and westernized Arab sweets made of coconut and chocolate at Pasteleria Diwan; and we ate the best couscous of our lives at La Mancha Chica Chaoen. This restaurant is run by a couple that came from Morocco 25 years ago. The small intimate room has only four tables, so the hospitable owner set up a makeshift table next to the counter so that we could have dinner without a reservation. We spent the evening chatting with him and watching subtitled Al Jazeera news. Our last night in Granada we had an unforgettable meal. Contrary to what one would expect in such cases, it was not a fancy candlelit dinner overlooking the Alhambra (a discarded option after careful analysis of the restaurants with these features…they all seemed too overpriced/touristy) but rather fried fish tapas at a communal table. Near our apartment, I spotted a very authentic-looking tapas bar specializing in mixed fried fish (one of my favorite dishes) and I asked my boyfriend if he wanted to have our last Granadian supper there. He gladly accepted the suggestion as he loves fried fish too (it’s one of the aspects on which we base our relationship). When we arrived at Los Diamantes on Calle Rosario, they told us that they had no fried calamari that evening, which was the very dish I wanted from the moment I landed in Granada. I was about to give in to my disappointment when my boyfriend dragged me out of the bar and led me to Plaza Nueva, where he had seen another Los Diamantes bar. Luckily for us, the menu included the fried calamari I had been dreaming about. Under our server’s astonished gaze, we indulged in a large serving of calamari, one of shrimp, one of the fried veggies, and one of mixed fried fish.